EUR/USD tumbled down on poor Euro-zone data. The Brexit extension hardly helps the pound, nor the euro. What a difference 36 hours make. EUR/USDtraded near 1.1450 late on Wednesday after the dovish Fed decision. However, the US Dollar remains the “cleanest shirt in the dirty pile“. The US still enjoys a strong economy, something the euro-zone doesn’t. The Euro received a cold shower or a reality check, and reality bites. Markit’s German Manufacturing Purchasing Managers’ Index crashed to 44.7, well below the 50-point threshold that separates contraction from expansion and significantly below 48 expected. Services PMI stood at 54.9 points, only marginally above projections. French data was weak as well with both sectors having PMIs below 50. The composite stands at 48.7. Estimates stood at 50.7 points. The bottom line is the euro-zone composite PMI which stands at 51.3, below 52 expected. These data are for March and are forward-looking. They reflect a weak first quarter and bleak prospects for the future. EUR/USD reacted with a crash, dipping below 1.1300. German 10-year bond yields fell to 0% for the first time since 2016. The euro was hardly cheered by the “Brextension.” European Union leaders decided to postpone Brexit to at least April 12th, adding two more weeks of relief. If the UK Parliament finally approves the Withdrawal Agreement, the UK will leave on May 22nd in an orderly fashion. If not, it is either a hard Brexit on April 12th or perhaps a long delay that could also entail new leadership, new elections, or a second referendum. Later today, Markit’s US Flash PMI data for March and Existing Home Sales for February will be of interest. A further reaction to the devastating data, Brexit developments and perhaps news from the Mueller investigation could rock markets. The Special Counsel may publish his conclusions as early as today according to speculation in Washington. EUR/USD has lost its upside Momentum on the four-hour chart and is now sliding. The Relative Strength Index has turned down but stays away from oversold conditions for now. The sharp move pierced the 50 and 200 Simple Moving Averages. All in all, bears seem to be in control. Immediate support is at the fresh low of 1.1288. Further down, 1.1275 was a stepping stone on the way up and works as support and so are 1.1250 and 1.1220. 1.1310 was a high point in early March. 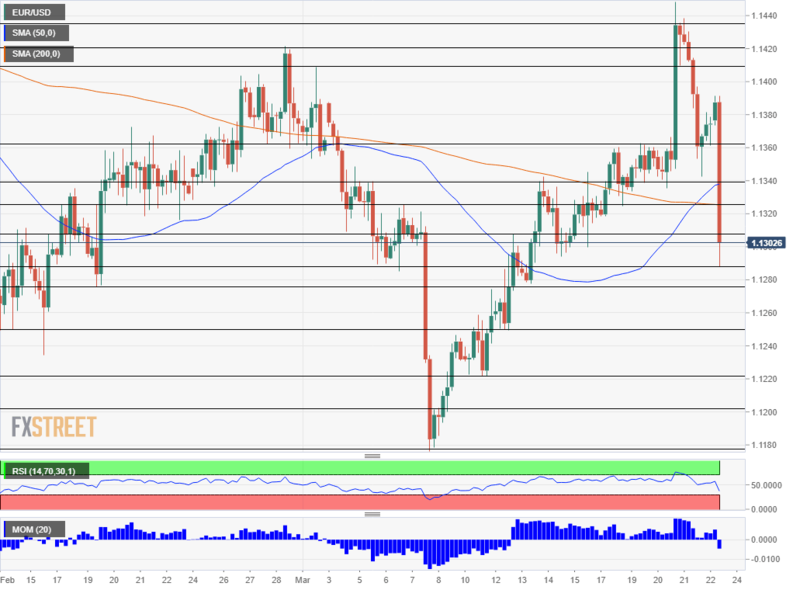 1.1325 is where the 200 SMA meets the price, 1.1340 was a swing low earlier this week, and 1.1360 was a stubborn cap before volatility picked up.